Irish beanies are sure to keep your head warm in cold weather. 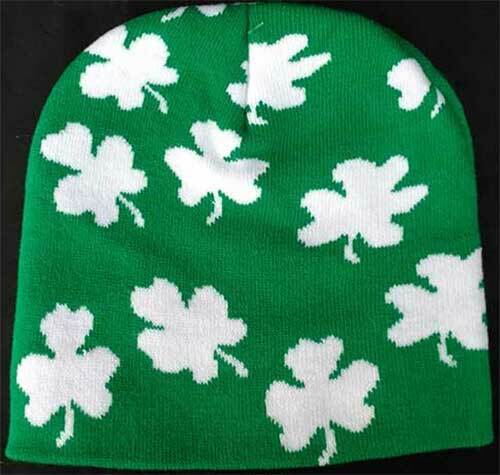 Select from Irish knit hats with shamrocks or with Guinness branding. These Irish beanies from The Irish Gift House are made of warm acrylic and would be ideal as ski hats or as stylish head wear for any cold weather application. Our selection of beanies would be appropriate to pair with one of our Irish sweatshirts; both garments would help keep you warm during cold weather and fashionably too. You will find that we stock pull over along with hoodie style sweatshirts for both women and men. The Irish Gift House offers several different types of head wear including Irish flat caps and baseball style Irish caps. Additionally, we have a selection of hats that are suitable for your St. Patrick's Day costume. You will find these over sized and humorous Irish hats in our St. Patrick's Day clothing section.